Gordon Cook has been kind enough to transcript Michel Bauwens’ presentation at last year’s Border’s to Cross Conference in Amsterdam. We’ve also included the video at the end for good measure, (so you can see Michel being “invited” offstage for going over his allotted time). The content is very interesting as it touches on the work being done in Ecuador for the FLOKSociety project, but it’s a succinctly expressed theoretical basis for possible P2P-partner state collaborations across the world. In many countries in Latin America the people in power do not call themselves political parties anymore. Rather there are civic movements. There is a civic coalition in Ecuador. There is a social movement in Bolivia. And there is a kind of rejection of political parties in that part of the world because they are seen as representing narrow interest-based politics. Despite the reforms that have been ongoing in Ecuador for the past decade, it is still pretty much a neocolonial economy that exports raw materials. Right now this works well because the Chinese economy that is there to buy them. But at the same time it is structurally weak because they have to import high value added consumption and production goods from abroad. This leaves them facing a long-term problem of trying to figure out how to get out from under this dependency. The president Rafael Correa has declared some time ago that he wants Ecuador to become an open social knowledge, commons based society. And I have been lucky enough to be called in as research director for a project that will present to the legislature a series of policy suggestions as to how this my be achieved. So very briefly this is the process. We have five areas of change that we are going to study. The first is human capabilities – how do people learn to share and cooperate and create commons together? As the foundation underlying this task and the four others there is a productive matrix. For example farmers in Ecuador still use the traditional methods of farming. Very productive in terms of nutrition but very weak in terms of the economy. At high level, the question becomes whether we can make a neo-traditional economy emerge in Ecuador with the use of appropriate technologies when in Ecuador no one is making those technologies. For example, instead of relying on agribusiness, which is not interested in that kind of economy, could we develop an open agricultural machining commons where a global community of engineers could work together on developing these type of machines to be made locally in micro-factories? So that is the general idea. The second area focuses on understanding the kinds of commons building efforts needed to move forward. The third area is institutional innovation and the fourth category is open technological innovation and a physical commons focused on housing and transportation is number five. This is organized by the Ministry of Knowledge and Talents of the planning office which belongs to the Ministry and I work more specifically for the Advanced Study Institute which has a contract with the Planning Ministry. So this is the process. We are researching the issues. We will hire 20 Ecuadorian and global experts who will produce 10 policy documents and then we will have an open source conference in March (or May) ? the President, members of the National Assembly, and civic leaders and the 20 experts will modify these documents and present the results to the National Assembly. I want to explain here the framing of this project and it is a bit of a critique of what I have on the proceedings. My thesis is very short. Yes we have democracy and politics – relatively speaking – but as soon as we start to work, most of the time we are in a feudal hierarchical relationship. If you look at how value is created, you will see that we create value as a private person by renting out our labor. This is captured in the market. And frankly civil society, in my vision, is relegated to what we do when we are tired and come home. We see this in our language. We talk about nonprofits as if profits were first and we talk about nongovernmental as though government is first. So the vision and Ecuador is based on the fact that we see an emergent mode of production that we call commons oriented. First I will explain the logic that underlies peer production and then I will go back to the way in which it expresses itself in reality. If you look at open knowledge like Wikipedia and if you look at free software like Linux, and open source cars like Wikispeed and open source satellites like Argie sat, there is something common among all these and it is something that is quite different in terms of value creation compared to how we do it today. These systems are based on contributions. People create a common pool of knowledge, code or design. The use value comes from being deposited in a common pool and around that common pool you see an entrepreneurial coalition. You think about the Linux economy. There is an interesting report in the US called the fair use economy. That estimates the value of the open knowledge economy to be one sixth of GDP. The entrepreneurial coalitions are companies that create value on top of the commons. Traditionally a for-profit company would actually destroy the Commons and enclose the commons but now we have these paradoxical situations where a company like IBM actually co-creates and coproduces the Linux Commons along with the efforts of the contributory community. This is just to say that the use value is deposited in the comments and then there is a market economy that grows up around it. Now with most of these projects there is associated a for benefit Association. Looking at Wikipedia for example, you have the Wikimedia foundation. The Wikimedia foundation enables and empowers the continuance of the collaboration. They do not command and control the production of the Wikipedia but they make it possible. Most of these projects have foundations. Whether it’s the Linux foundation or the Apache foundation, the bit coin foundation and so on. These projects than are governed by the foundations and the leap of faith that we are making is that this emerging mode of value creation is also the shape of a commons based economy. And a commons economic and political system. This is the thesis that we defend. And therefore what we do is that we go from the micro economy where this is already operating to the macro economy. And we ask then what would a society look like that is already operating in the emerging mode of commons oriented peer production. Basically such a society would be centered around civil society which had already become productive. Contributors as citizens are creating common values together in many many fields. And we have seen this today and yesterday. In many talks we see this modality operating in an open participatory process where something is made that is universally made available to the community. Then we would have a market space. And what we try to do in Ecuador is to develop an ethical economy, a solidarity economy. Now you may ask what is the difference? Well think about the wikispeed open source car. This is a car that was designed in three months by 80 people in a dozen countries where they actually design a new car every week as opposed to Detroit which needs five years to integrate an innovation. Detroit puts out a new car every year but by the time innovation gets into a new car it is five years old. The wikispeed car is designed for a micro-factory system. So basically they use a method of design called extreme manufacturing. With very rapid iterative development. It is organized in a modular fashion so that any car engineer in the world can contribute to the knowledge commons of wiki speed and very interestingly the physical mode of production is also based on distributed means of production. It is based on the idea of micro-factories where using a combination of 3-D printing machines where you can reassemble the car like a Lego and make it locally. So this is interesting thing for a country like Ecuador which lacks a number of industries. But here is a problem. Wikispeed does not find investors. Why? Because those with capital do not want to invest their capital in anything that is based on intellectually property free knowledge. This is true because the economy today is not based on production but rather based on financialization. Consequently we need other forms of economies that can work with this kind of system. And then regarding the state, if you look at a for benefit Association and you see what the state does, we come to the concept of a partner state. What is a partner state? 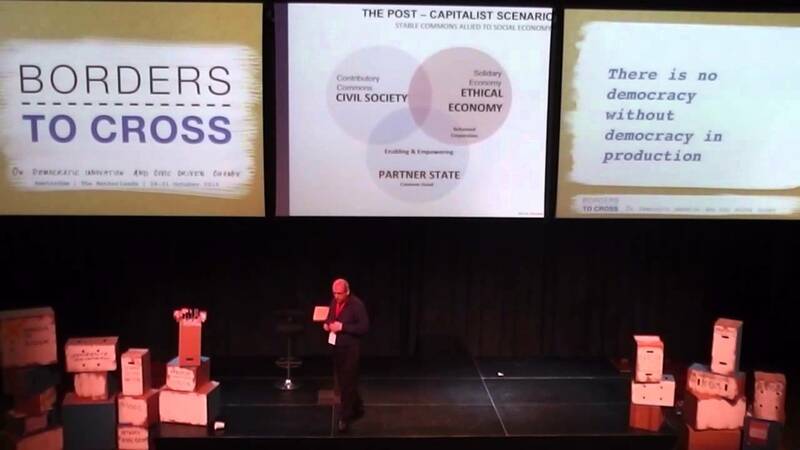 A partner state is a state form that enables and empowers autonomous social production. So a bit what you did Frank with the burning Man local festival was to enable and empowered the autonomy of the civic field to actually produce something. So it is not privatization. It is not centralization but rather it is helping civil society to do something by itself on its own. We also use terms like the commonification of public services, of public commons partnerships instead of public-private partnerships to express this attitude. Now we do have a problem in that peer production is hyper productive. Whenever you have a situation where this kind of open eco system enters, the proprietary alternatives start to lose their dominance. Right now we have a paradox in that capital is much more eager to invest in peer production than to invest in alternatives. And the problem with that is crowdsourcing. Crowdsourcing is great. You expanded the input of knowledge and expertise from outside that which is held by your in group. So you have more innovation. But in this form of disaggregated input from the outside what you get is a minimum wage that is two dollars an hour. So the average wage of crowd sourced labor in the US is one fifth of the minimum wage. So operating under the conditions of financial capital, this is a problem and this is something that we want to avoid. This is a blueprint of what we are trying to do. So imagine a society where every sector would be governed or produced by an open commons. So you have an open education commons; you have an open science Commons; you have an open agricultural machining, and this, you have a seed Commons and you have an open industrial sector Commons. If you want this, you need a feeding mechanism. For example you cannot have an open education commons, if you do not have open textbooks and open courseware. Therefore if you want to implement this vision, we need legislation and regulations that actually allow this to happen within Ecuadorian society. So how we do that? Just to give you a little anecdote textbooks and school costs $70. They change two or three lines every year and, as soon as that happens, you have to buy a new one. Now the indigenous people cannot afford it. But they still buy it because of social status when they actually come to school with the older version people look down on them and they don’t want it. So even the people without money are really impoverishing themselves by buying these proprietary textbooks. So you need open textbooks. You need open courseware and stuff like that. If you wanted open science Commons, you need open access publishing rules. If you want a civic commons, you need open government data. I think you get the idea. So we are working on what kind of feeding mechanisms do we need to develop in order to attain such a commons based society. Then we need material and immaterial infrastructures. And very briefly I can give you an example of each. We need an Internet of energy. Like Jeremy Rifkin, based on the same idea. We want to empower people to produce much energy as they can on their own local and neighborhood levels. And for that you need a smart grid. For example in Bangladesh and there are many villages now where you can see solar panels but there is no grid. You also need a smart grid that would allow this kind of bottom up sharing and exchange of energy production. If you want to make these of an agricultural machines you need micro-factories you need maker spaces; you need hacker spaces. You need co-working spaces so this is an example of the material infrastructure. Now let me give two examples of immaterial infrastructures. If capital does not want to invest in a project like wikispeed which produces a vehicle that is five times as fuel in the efficient as an industrial made car, this is a crime basically. Continuing to make cars that are five times as polluting by virtue of the fuel they burn when you have the possibility of producing a card that requires only one fifth of the fuel has a real problem especially in our current society that is played by ecological problems. How do you get investments that are relevant to this type of situation? We talk about open venture funding. This is the kind of system that could allow such an investment to take place. Open value accounting becomes relevant to where you have an open contributory system and you want to avoid an outcome where only a few people capture the value of the new development and market value solely for their own benefit. You run into the situation where you have many people contributing to a common goal and only a few big companies capturing value built-up there in. Think about Facebook for example. 100% of the value comes from us. An empty platform is valueless. But we don’t get any exchange value from Facebook. Effectively, it captures 100% of the exchange value. Open value accounting refers to various methods that are experimented with to actually measure reward contributions to a system rather than labor and capital. This is what we are working on. And you may ask what does it have to do with democracy? Well to explain I will come back to the original idea. There are three players and the first player is the community. But the community of contributors is not democratic. It is based on open allocation and self aggregation. So where in this is the freedom? We may argue that it is an enormous increase in freedom if people can choose their own tasks and choose their own jobs. This is I believe an advance in civilization, if we can achieve this on a wider scale. Consider the ethical economy. If we have a system which privileges the creation of new types of actors and to give you an example of one of the forms that I like, it is solidarity co-ops. This is a new form of co-ops that move from single stakeholder management to multi-stakeholder management. The goal here is to avoid a situation where workers co-op and consumer co-ops are fighting each other. For example in Italy, you have social care co-ops that are funded by the government but they are managed by their user communities including the nurses the doctors, the hospitals and so on. The way forward would appear again to be multi-stakeholder governance and in Canada we find now that 98% of new co-ops are these multi-stakeholder co-op’s. In South America many governments have these kinds of associations already. If you think about Brazil, they had a law on the solidarity co-ops and a law on complementary currencies and they are already enabling them to emerge. And so the second thing is for democracy that we have more market democratic entities. Now this is already happening. There is a little coffee company that wanted to make good coffee without exploiting its workers and being able to make a living from it. So this is what they do. Open logistics. Open accounting. Open research. Crowd funded retail expansion. And they hacked the espresso machine on top of it all. So this is a really new way of doing things. Now let me conclude with a historical comparison. There is a fantastic book called Red Plenty. And most of you may not already know that the Russians invented the Internet. And then they killed it. And the book is about a debate in the 1960s inside the Communist Party of the Soviet Union about how to plan more efficiently. They invented such a system and tghen saw that it dramatically undercut the hierarchy on which their privileges pended and consequently they very quickly said “we will kill it.” In the 1970s when Allende came to power he talked with Stafford beer a leading complexity theorist and together they created something called cyber sync. The first thing that Pinochet did was not sent his followers to Alice bot on cyber sick. Cyber sync was a system for open democratic participatory planning. It didn’t work. It didn’t have time to work. So what we are doing in Ecuador if you like, is taking up the thread because imagine this. If you have an open commons and you have an ethical coalition working around it, it becomes very easy to practice open accounting and open logistics and thereby pragmatically creating a a system of mutual coordination. This is not planning and this is not the market. This is creating a new system. And so what I am suggesting is that instead of looking at the Lib Lab, this is the industrial system where we either privatize or we regulate. Where the only choice is state or private. That we work in a triarchical way. We have the state. We have the civic society with the commons and we have the market with an ethical economy.